ST. GEORGE — A McDonald’s fast food restaurant in Mesquite was shut down by health inspectors last week after receiving 27 demerits. Officials with the Southern Nevada Health District shut down the Mesquite McDonald’s restaurant located at 190 E. Pioneer Blvd., a representative of the health district confirmed Thursday, adding that the restaurant was reopened later the same day. During a routine health inspection Oct. 19, inspectors found staff not properly washing their hands, food not cooked or reheated to proper temperatures, potentially hazardous foods held at the wrong temperature and food unprotected from potential contamination, among other violations, according to the environmental health inspection report. Inspectors initially visited the restaurant Sept. 21 and issued nine demerits. Upon returning to the restaurant Thursday, inspectors found several risk factors for foodborne illness, according to the inspection report. The restaurant received five demerits under hand-washing as required; when required, proper glove use; no barehand contact of ready-to-eat foods, the report states. Risk factors of concern: poor personal hygiene, including improper hand-washing and/or barehand contact with ready-to-eat foods, as well as food service employees working while sick with symptoms, such as vomiting, diarrhea, sore throat with fever, jaundice or infected cuts or burns on hands and wrists, the health district states on its website. The fast-food chain received five demerits under potentially harmful foods not cooked and reheated to proper temperatures. Risk factors of concern: improper cooking temperatures and reheating methods. Food handlers must know final cooking and reheating temperatures, and the use of a stem thermometer is taking place to ensure that foods meet the minimum safe-cooking temperatures. Cooking temperatures are based on the temperatures required to reduce bacteria to a safe level in the foods we eat. Different raw, potentially hazardous foods have different levels and types of bacteria living in them and must be cooked to different temperatures. If you fail to reach these temperatures for the time required, some of the bacteria may survive and make your customers ill. The restaurant further received five demerits under keeping potentially hazardous foods at proper temperatures during storage, display, service, transport and holding, according to the inspection report. Risk factors of concern: improper holding, time and temperature of potentially hazardous food as bacteria grow best between 41 degrees and 135 degrees. Having food in this temperature range for unknown time frames allows bacteria to reproduce, which can make customers ill, the health district said. Three demerits were issued for food not being protected from potential contamination during storage and preparation. The restaurant was issued three demerits regarding having hand-washing facilities adequate in number, stocked, accessible and limited to hand-washing only. Three demerits were issued relating to having hot and cold holding equipment that is properly designed, maintained and operated. The restaurant received three additional demerits under accurate thermometers provided and used. The health district conducts unannounced inspections at least once a year. 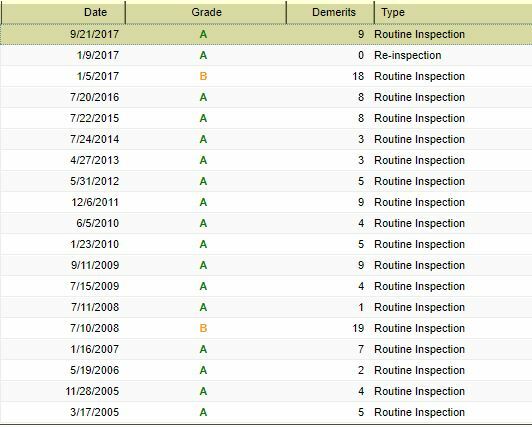 The fast food restaurant had received mostly A grades on previous environmental health inspection reports. A manager of the fast food restaurant declined to comment Tuesday regarding the restaurant closure and violations. Very poor management at many McD’s. My biggest pet peave is being handed a soda cup which has their fingers inside and on the lip!!!!! Gross. Back in the “old days” cleanliness was always stressed at McD’s. Half of everyone in Mesquite is doped up on something, so it’s their own fault making the entire city a giant cesspool of muck. Really? Half of us? I suspect you must be referring to Mesquite, Texas. Mesquite, Nevada is a wonderful place to live and raise a family. And our percentage of drug abusers is a fraction of you folks in Southern Utah that are trying to escape your reality. No, I was referring to Mesquite, NV. Instead of getting angry, you should be grateful you were raised correctly to not abuse drugs. This means you are in the good half, not the bad half, so consider that a compliment. Congrats! No where is a “wonderful place” Mesquite true maybe the drug use is bad on our side but Nevada has one of the highest homicide and violent crimes in the nation. I’m not choosing sides ok have a nice day! Oh and also most of the drugs come in through southern Nevada. So guess we’re not the only ones trying to escape reality. Have a nice day either way! By any means not true…I don’t do drugs, my sons don’t do drugs, there girlfriends don’t do drugs….this is more a retirement town then a druggy town…you want to see a drug town go to Seattle…the. You can talk **** but this town is the best place I have lived so far to raise a child..only thing missing is more stuff to do around here..also I thin’ y’all are talking more about Vegas then here cause yes it is like that there…this is just a small town!!! Besides no one is perfect and I’m sure your not as well!!!! As for drugs coming though southern Nevada I think again u mean Vegas..we are just the middle town between y’all and Vegas they have to drive though!!!! Get **** right!!! I moved here 10yrs ago and this is by far noting like a city….not even Vegas is like the city I come from y’all don’t know the real meaning of dope heads!!! Even st George that’s more like a suburb from where I’m from so chill the hell out plus this is about mcds..noting to do with damn drugs!!!! * Ed. note- Asterisks added. That store is always so busy! They employees r crowded on top of each other, that restaurant needs to be bigger, miserable crowded employees makes for sloppiness. That’s a busy place. Thing is the night before they had a big rebrand opening due to some remodeling they just did..Ronald was there having a show outside so lots of kids and people there..we where there as well..so makes me wounderful if it was just issues from a long party night there!?!? But I do have to say I have never gotten sick eating there and we like that one better then the one across town!!! So it’s strange how they had all these issues!! Still think it’s from the night before plus workers tired!!! It was a crazy night there!